In Denver, Peak to Peak Roofing & Exteriors has developed a niche market. They specialize in wood shake roof replacement, specifically those with full insurance replacement benefits. "Oftentimes homeowners that have been denied or offered partial funds for a roof repair come to us and we help them receive the full coverage replacement costs for their roof," says Judith Eyre, production coordinator for Peak to Peak Roofing & Exteriors. "Wood shake roofs in our area take a beating from severe weather conditions including wind and hail. We go in and provide roofing options that allow homeowners to safeguard their homes." 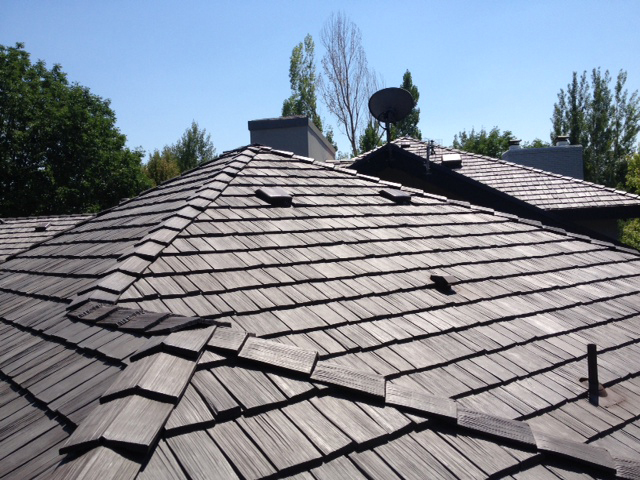 As an example, Eyre points to a recently-completed Bellaforté synthetic roofing replacement on a home in Cherry Hills Village, Colorado. "This home had 20+ year old wood shakes in fair to poor condition," says Eyre. "We went in and recommended the DaVinci shake product, selling the homeowner on the proven impact and fire resistant ratings, along with the 50-year DaVinci limited warranty. "The Bellaforté Shake product was an ideal solution for our customer because their appearance mimics real wood shakes while the strength of the polymer tiles will hold up against severe Colorado weather conditions in the future." The company was able to work with the homeowner's insurance company to get full replacement funding for the old roof, which had experienced hail and wind damage over the years. "These homeowners are very happy with the polymer Bellaforté Shake roof and they love their new color," says Eyre. "The Abruzzo blend of three mountain colors perfectly replicates their original cedar roof, however now the homeowners have a roof they can depend on to help protect their home." Visit Colorado Resident Saves 25% on Homeowner Insurance with Polymer Shake Roof for another story on cost-saving imitation shake roofing from DaVinci.